Superstar singer, Katy Perry, knows how to make a fun, but dramatic impression whether on stage or with her fragrance line done in conjunction with Coty Beauty. For her third perfume’s release in 2014, she made sure to take no prisoners with this unique, creamy fruity-floral perfume created by perfumer, Pierre Negrin, with her Royal Revolution Eau de Parfum. With top notes of pink freesia and red pomegranates, the opening is sweet and juicy. This combo seems to sugarcoat the floral note with its red fruity essence instead of contributing an element of freshness as you might expect. By the time this fragrance warms in the heart, the notes of sandalwood, orange flower and jasmine petals take ranking precedence for an alluring hold on the senses that is unexplainable in how it effortlessly captivates. However, the real magic to this fragrance happens in the base. The note of blackthorn in particular seems to cast a spell of crushing resistance like an initial weapon to break hearts before the rest of the notes of vanilla orchid, leather, and skin musk emerge, arriving to finish what it has won with its dominating power. Making sure to take no prisoners, Royal Revolution is creamy, sweet seduction that you wish would never stop with an unexpected powdery twist within its depths. I enjoyed this fragrance very much. My only wish is to make its lovely blue diamond bottle to stand instead of needing to lie flat so it could take less space on my crowded vanity. 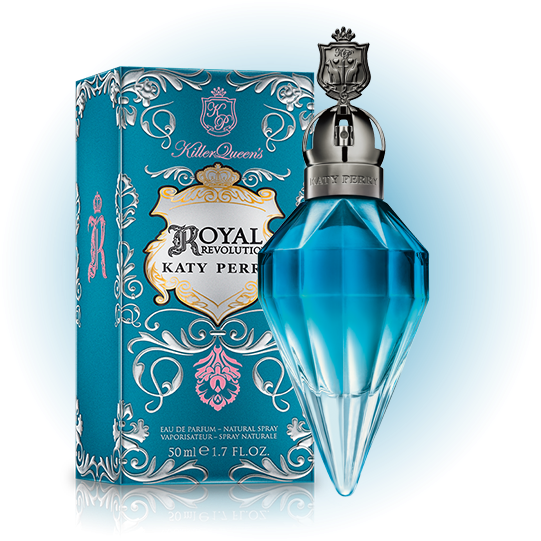 Have you tried Katy Perry’s Royal Revolution perfume yet? If not, you owe it to yourself to check this fragrance out. Thanks to Coty Beauty and Katy Perry Fragrances , one lucky Nuts 4 Stuff reader in the United States wins a one-oz. bottle of Royal Revolution Eau de Parfum ($30 value)! Prize: One (1) winner will a one-oz. bottle of Katy Perry’s Eau de Parfum ($30 value)! Eligibility: Open to USA. The winner will need to respond to my email with name and shipping address within 48-hours or another winner will be picked. Previous Post The Order of How You Apply Your Eyeliner and Shadows Matter When Perfecting Your Look! Killer Queen is one of my favorites. I learned it has sandalwood in it, which is my favorite!!! I learned that the Top NotesTahitian Vanilla Orchid, Fresh & Crisp Apple Musk, Sweet White Peony is a scent I must try. I learned that the MIDDLE NOTES are Madagascar Bourbon Vanilla, Soft & Whipped Fluffy Musk, Luminous Jasmine Petals. Katy's fragrances are available at many retail locations, including CVS, and Kohl's. I subscribe to Katy Perry Fragrances on youtube as dglitter. I learned that Mad Potion has vanillas from around the world. Katy Perry's new fragrance is Mad Potion and it's top notes are Tahitian Vanilla Orchid, Fresh & Crisp Apple Musk, Sweet White Peony. Katy Perry has some very awesome fragrances! I learned that she currently has 4 fragrances. I would like to try Killer Queen and for beauty it would be brittle nails. I learned that this particular perfume has Mystical Blackthorn in it, which was used many years ago due to its magical and protective powers. I would say the Purr is more something for me. I like the pear over tones in this scent. Thanks so much! I love Katy Perry! Mad Potion has notes of apple! I learned that one of her fragrances is called MadPotion. I learned that one of the bottom notes is Vanilla Orchid, which I love. I learned that there's a new scent in Katy Perry’s line called Mad Potion, which is an oriental musk type scent! I signed up for the KP fragrance youtube channel. I learned that it contains apple and vanilla. I learned that Katy Perry has 4 perfumes altogether. I love Katy Perry's Killer Queen Perfume! I learned that this fragrance has top notes of Pink Freesia and Red Pomegranate and it sounds amazing! I learned about the top, middle, and base notes of the Royal perfume. The middle notes seem like they'd hook me in the most with sandalwood, orange flower, and jasmine petal; Sounds delightful! I'd also like to try Purr and Mad Potion!! I don't know if this is correct but since it's an option I'll just post what I posted on the Keune giveaway: I would love to try Keune's design root volumizer because I'll try ANY volumizing product on the market, especially mousse products meant for the roots (They seem to work best for me). My personal problem is that I have extremely thin hair and not too much of it either, it's not a lifestyle problem, but a genetic problem that has been passed down from my great grandmother…to my grandmother…to my mother, and so forth. It's extremely hard to style or do anything with my hair when I'm always trying to cover the bare/balder spots on my scalp. I've tried pills, expensive shampoo/conditioners, tons of styling products, and most recently hair fibers.. but unfortunately, there is no quick fix for thin hair–One day I'll just say the heck with it and jump on the wig bandwagon! I would also love to try the Mad Potion! I learned that the fragrance duo of glowing amber and jasmine petals provide a twist of mysterious and playful fun. I've learned this is available at Kohl's! I think it's cool that she has a fragrance called Killer Queen. My biggest hair concern is how to tame the curls and control frizz. I learned Mad Potion contains notes of Tahitian Vanilla Orchid. I learned Mad Potion is made with Soft & Whipped Fluffy Musk. My wife would like to try Killer Queen. Her biggest beauty concern is dry hair. I learned that Purr's top notes are Peach Nectar, Forbidden Apple and Green Bamboo. It is one of my favorite perfumes! I din't know that Katy Perry had one fragrance let alone four. My wife and I both have curly hair so I would say controlling the frizz. I learned that it has notes of Mystical Blackthorn, which is a flower known in the dark ages for its magical and protective powers. learned Dark Horse” has reached over 1 BILLION views and was just confirmed 10x Certified on Vevo! I learned that you can get this at my favorite store, Kohl's. I was surprised to see that it was available at so many places. The Keune Shaping Hairspray Super is my favorite item on sale. My biggest hair-day problem is when the hair won't stay combed right. I want to try her Mad Potion perfume too! One problem I'm having with my hair is right now it's super dry and when I use conditioner then it feels weighed down. I need to find the perfect conditioner. Opps forgot to add about the hair stuff. I would like to try their DESIGN REPAIR CONDITIONER. Thank You for the giveaway… Katy Perry's Mad Potion is rich with deliciously seductive vanillas from around the world. I subscribed to the Katy Perry Fragrances YouTube channel under the username mslilyk. I would like to try the so pure moisturizing essential oil. My biggest beauty problem is split ends.